Families are structures that rely on homeostasis to keep the family in tact. Problem behaviors can sometimes maintain the homeostasis in the family therefore a problem in the family is looked on as part of the system rather than individually. Since each family has its own culture, the therapist must join the family to establish its rules and functioning. A therapist joins the family by addressing each person, getting each person’s feedback, at times using the family’s language jargon and in this way determining each person’s ideas about the problem. Minuchin first developed structural family therapy and defined the family rules, dynamics, patterns, rituals and structure. Minuchin believed family structure such as relationships and hierarchies that he called family subsystems, can be changed. Rituals and rules however need to be examined to see how they impact the problem and solution. Boundaries are explored and new patterns of interaction can be practiced and integrated. Families with a child that constantly misbehaves can get help with structural family therapy. 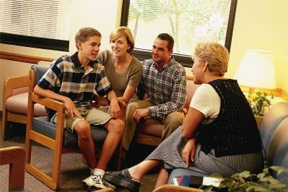 Blended families often have adjustment problems and may seek help with family therapy.